This is a practical guide to using spiritual circles. It is an inspirational exploration of the beautiful and intricate art of mandalas, and their role in spiritual growth and meditation. It includes step-by-step instructions for creating your own designs for traditional and contemporary mandalas, and a guide to natural mandalas such as snowflakes, tree rings and spiral galaxies. It is illustrated with images from the four corners of the world, from symbolic Hindu paintings and incredibly complex Tibetan sand paintings to Celtic spirals. A mandala is a picture, usually circular, that tells the story of a journey that can be followed by the inner mind. This unique book describes how mandalas have been used over the centuries by different cultures, as a means of focus in meditation. As well as explaining the art of these beautiful images, the book goes on to give instructions on how to create your own mandala in various different styles. 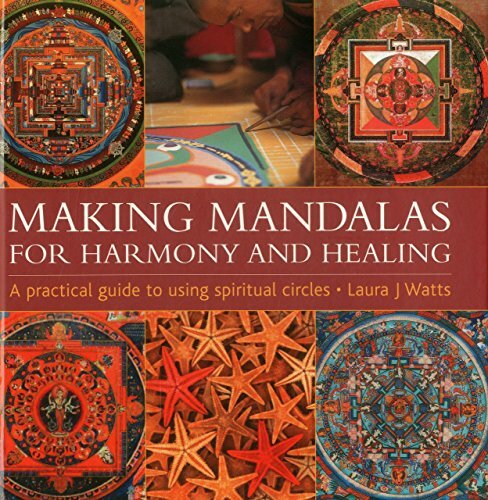 The final part of the book offers help on how to use a mandala for creative, healing and personal meditations. Covering Celtic symbols and Navajo sand paintings as well as traditional Buddhist and Hindu mandalas, the book also features more modern mandalas created as an aid to psychological understanding. Illustrated throughout with inspiring images as well as practical photographs this book covers every aspect of making and using these spiritual circles.